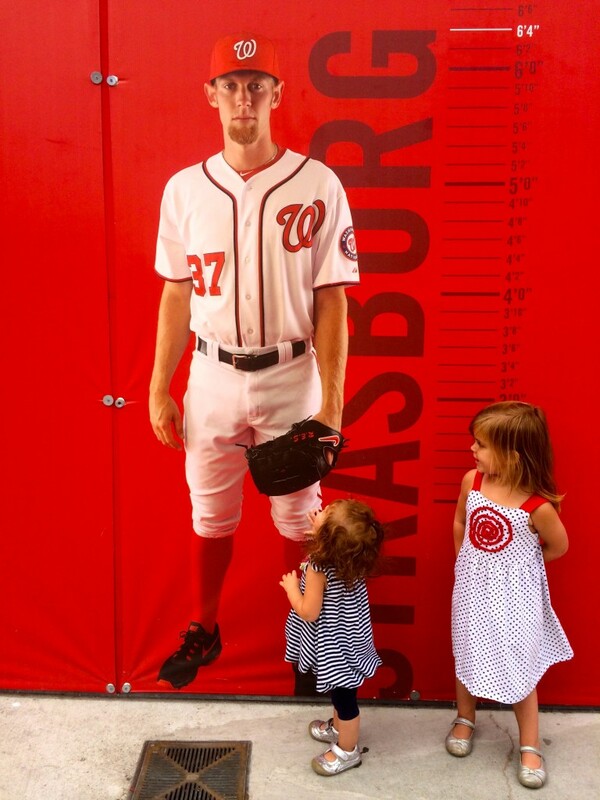 We have been wanting to go to a Nationals game all summer. Finally, we had a free Sunday so I bought tickets for the family to go to the 1:35pm game against the Giants. We decided to drive down to the stadium and of course, we got stuck in traffic. We ended up getting down there a little after the start of the game and pulled up to the closest parking garage to surprisingly find that they still had spots available. Parking was $30 but definitely worth it since we were late and only had a short walk to the stadium. Children 2 years of age and under are not required to have a ticket as long as they sit on the lap of an accompanying adult. Yay, Mae you are free! 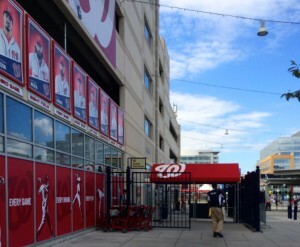 Strollers are allowed in all concourse areas at Nationals Park. 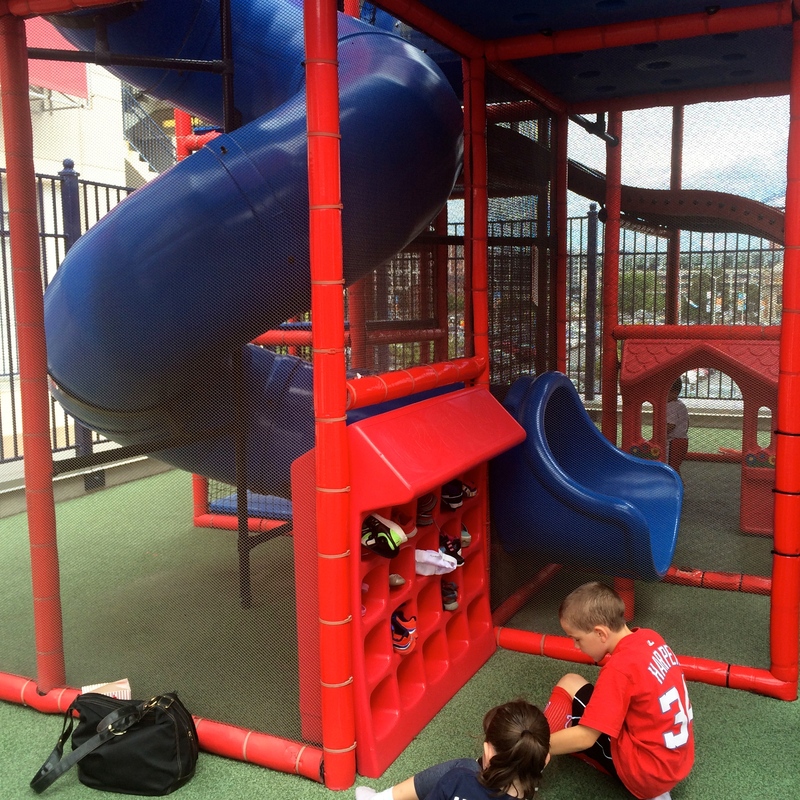 Strollers that are unable to fold and fit under the seats have to be checked either at a Guest Services location, the Center Field Plaza or behind Sections 131 or 321. 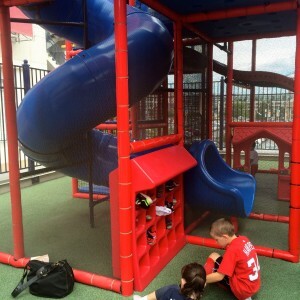 I brought our City Mini stroller, so I checked it at the Guest Services that was located just inside the Center Field gates. Our seats were great! 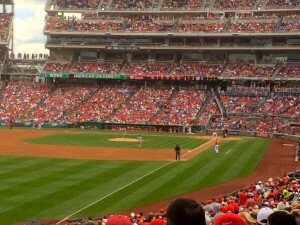 We sat on the third base side of the field, so we were not directly in the sun. And the bathrooms (including family restrooms equipped with baby changing stations) were located in the concourse directly behind our section. Always a good thing to be near bathrooms when you have toddlers and babies with you. 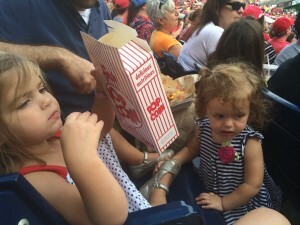 The girls were content in our seats for a while noshing on hotdogs, Boardwalk fries, and popcorn. 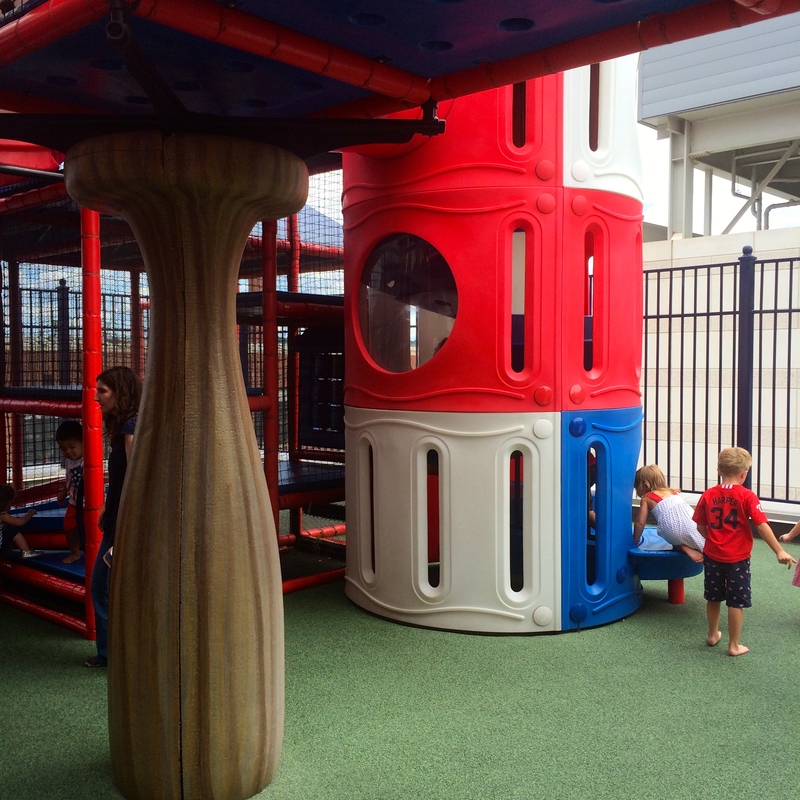 After filling their bellies with ballpark fare, the girls were getting antsy so I took them over the jungle gym located in the Right Field Gate. We had to wait in line for 10 minutes to get inside. They only allow about 10 kids in at a time and give them 10 minutes to play before they rotate them out for the next group. 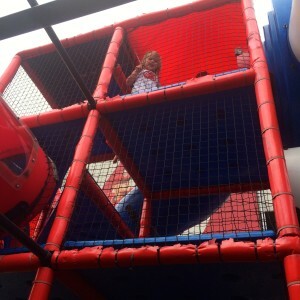 There are lots of places to climb up and a few different slides on the structure. 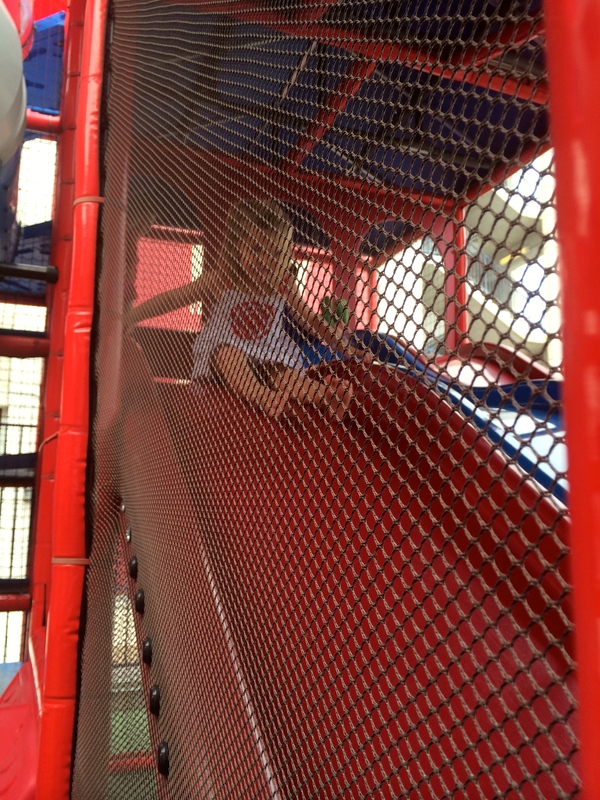 Best for ages 3-8, but my little Mae (13 months) had a blast running around and climbing up on the lower platform areas. Also, fun for kids ages 12 and younger is the Jr. Nationals Kids Club. 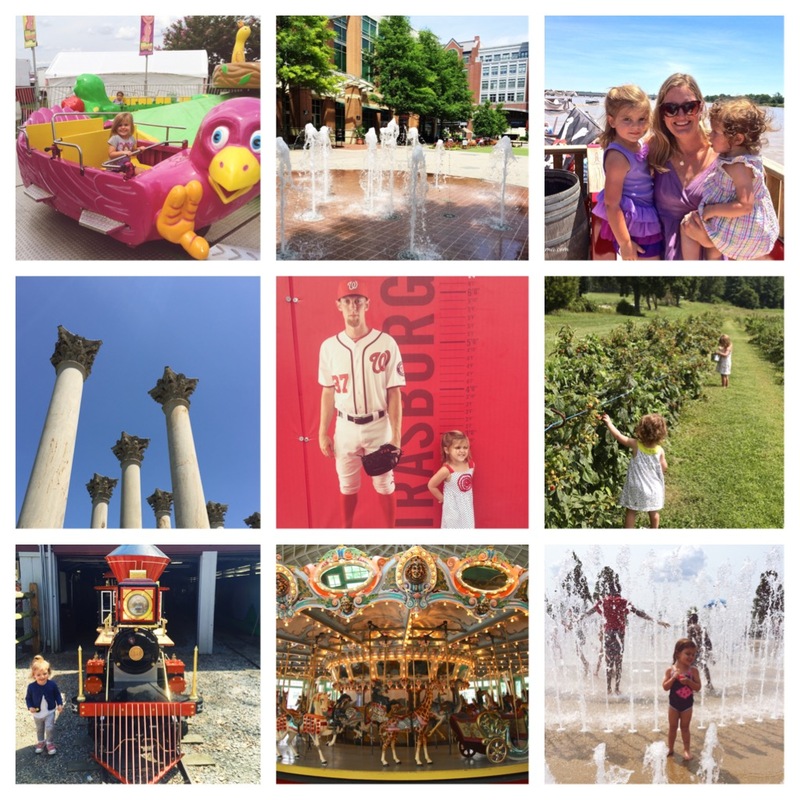 Members receive a membership card, messenger bag, coupon book for discounts on tickets, front-of-line privileges for Kids Run the Bases and more. The Jr. Nationals kiosk is located just in front of the kids play area. For details, go to nationals.com/jrnats. I didn’t register the girls for the club but I do think it would be great to do when they are older and we can attend more games. After select Sunday home games, children can take part in the Kids Run the Bases. All kids ages 4-12 are encouraged to participate. We didn’t stay for the whole game this time but next summer I would love to have Clara participate in this; she would absolutely love it. 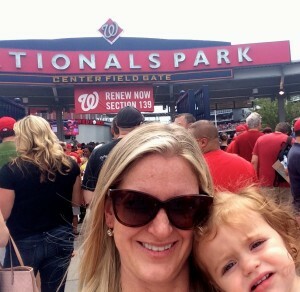 We had a great time at the Nationals game as a family. After about three hours, Mae was wiped out, so we decided to head home and she immediately fell asleep in the car. 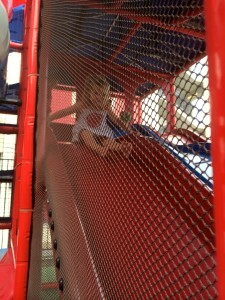 Clara had so much fun and did not want to leave. Her favorite part was cheering! She has asked a few times if we can go to another game.